Today’s NY Value is about expectation. Along with our perceived selfishness and rudeness, there’s an idea of New Yorkers as unwilling to settle for less, our “go big or go home” mentality driving us to compete ruthlessly with one another, to send back dishes at restaurants, to scream at assistants, and to whine and moan about any perceived dip in quality. But what if New Yorkers actually grit-our-teeth-and-bear more on a day to day basis than your average person? What about the inevitable pitfalls of living in such close quarters with so many people, of depending on government-sponsored infrastructure, and of the confusing balance between American individualism and extreme cohabitation? Specifically, what about the trains? As you know if you follow me on Instagram or Twitter, I’m not a huge fan of the MTA (Metropolitan Transportation Authority) right now. Our subway system is in a declared state of emergency following an A train derailing at my stop last June, and things have not improved over the past few months. This morning, passengers and I waited for 15 minutes for a train “3 minutes away.” It was still allegedly not yet arriving when it pulled into the station. There’s a mentality in the state government, a group of people who absolutely do not rely on the system they starved with mismanagement, that we are being whiny and need to cut them some slack. They gave us the subway time app, which is somewhat dependable and has made my life easier. They gave us screens in most stations to tell us when the next train is arriving (to varying degrees of accuracy). They gave us cell phone service underground. But, as a recent NY Times op ed pointed out, these are far from lavish upgrades; they’re kind of the bare minimum. The stations are still in disrepair, the trains are still consistently delayed, and they recently put out an statement explaining that the subway platforms are so slippery when wet because of years of gunk cemented to the ground. I also believed I was being a little whiny until I had a Fulbright scholar from Uzbekistan stay with me, and she was HORRIFIED by our transit system. She called it disgusting, unreliable, and generally awful, confused how anyone could use it for their daily commute. Granted, our subway is more extensive than the Tashkent Metro, and we have a very different government, but we already use this information to temper our expectations. “I’m just happy to be here” is the new New York motto. Rents are high and constantly increasing, work is harder to come by, and we lack negotiating power with employers because many willing and able candidates are just a call away. New York has become, to many, aspirational, meaning we residents put up with a lot of nonsense just so we can be a part of it. Much like the real estate industry, there’s a high drop-out percentage, especially during your first three years. Not everyone wants to make the lifestyle concessions needed to succeed here. For many, it's just not worth it. Speaking of real estate, the other half of today’s value is about a similar misconception: that NY brokers are giant assholes just waiting to cut one another down and steal their business. Compass will credit themselves with changing the game, and they absolutely have. As they love to say, “we win on culture,” and I agree. On my second day an agent was being yelled at on the phone, and by the time she hung up three other agents had already rushed over to offer her support, snacks, and a shot of tequila. But it isn’t just Compass; it’s also access to information that leveled the playing field. In 2013, when I almost started my real estate career before getting cold feet, the industry was very different than it is today. Many new agents cut their teeth on Craigslist “bait and switch” listings. You’d find out what new rentals landlords had put up that morning, rush to go take photos, and then put them on Craigslist as though it was your listing. The first one to get it up would get the most calls, and potentially be able to turn all these leads into clients. Now, listing information is more readily available online thanks to StreetEasy, Zillow, etc, and an agent’s value comes less from being the first to throw some iPhone pictures up on Craigslist, and more from what they can provide as a guide or consultant. The whole industry is learning what some of the best agents knew early on: this should be a referral business rather than a transactional one. So, whenever you’re looking for an agent, be it to sell, buy, or rent, know that we all have access to the same listings and information, even if some companies, like Compass, have better tech than others. You should choose a broker who you trust and enjoy spending time with, rather than one who claims to have the “in” on any market. 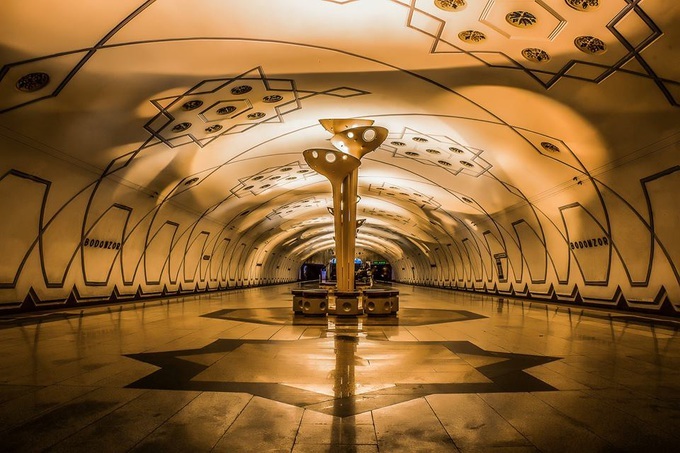 Oh, and now, to upset you all, here are pictures of the Tashkent Metro stations. So next time someone tells you that you are expecting too much from the government with your desire to actually be able to get to work at a consistent speed (rather than “typically 25-50 minutes”), you can show them this. Because I thrive on content creation, especially about the city I’ve grown to love so intensely, I’m beginning a weekly column of sorts called New York Values, a play on the insult lobbed at us metropolitan folks by those who want to paint urban dwellers as Godless and out-for-themselves. In reality, nothing could be further from the truth, and I’ve seen at least as much behavior that would make Jesus (or whomever) proud here as in my time spent living in rural Virginia or traveling through devout lands. Because I do real estate now, it’s going to also include another “value”: a listing, tip, or fact about renting/buying/selling that I’ve learned on the other side of the looking glass. Who doesn’t like learning or looking at pictures of gorgeous apartments? Weirdos, that’s who. And, because it’s me, this first post is about a strong woman standing up to some bigotry. One summer morning in 1854, Elizabeth Jennings, a young black schoolteacher, was headed to play the organ at her church. She hailed a horse-drawn streetcar; the conductor didn’t want to let her in because of her race, but she prevailed by jumping in and hanging onto the window frame when he tried to forcibly remove her. This led to the city’s public transportation becoming largely desegregated within five years. And now, over a century later, the subway boasts an impressive diversity, with its passengers uniformly opposing the intoxicated, poorly behaved, and/or diseased (looking at you, person who gave me the flu on the A train). Obviously this was a long time ago and doesn’t speak to the current character of the city, but a few things do. 1. This was spotlighted by the New York Times in 2018; they do a daily NY news blast and it’s often focused around a personal interest story about a community activist. It’s probably where a fair amount of these little articles will originate, and it’s a nice way to start your day before you cram onto a crowded train to smell someone’s breath for 30 minutes #doweneedtobetouching. 2. In 2007 the city put up a sign reading Elizabeth Jennings Place on a street corner blocks from where she made her stand. There are spots like this all over NY, with roughly 1,600 honorific street names immortalizing people like musicians, activists, and religious leaders. Who’s Godless now? 3. The reason this street was honorifically named? A group of third and fourth graders at nearby P.S. 361 were so moved by her story that they asked the city. It took them a year, but through petitions, meetings, and a campaign of pressuring local officials, they made it happen. If I had learned this valuable civics lesson at 9 years old I would be way more excited about government. And now for the real estate part: fun mortgage info! Did you know that nationwide people are speculating about how the impending mortgage rate hike will affect the RE market? Did you know that some agents are very stressed about how this will affect their business? Did you know that I am zero percent concerned because people will always buy homes and I do not yet have a consistent income I’m afraid to lose? However, as my senior broker Joe Quiros likes to say, “You don’t live in in the PRICE; you live in the PAYMENT.” So, for every percent the rates increase, your monthly mortgage payments on a 30 year loan increase 12%. Essentially what this means is that while people will not stop buying, their dollar will not go as far, because the same priced apartment will now cost them 12% more per month than if they had locked in earlier. For example, for every $100,000 borrowed at 5% interest, you owe $59.40 per month MORE than you would at a 4% rate. That's not a huge difference on a small loan, but NY loans are often sizable, meaning this scales to more like $500/month additional. If you have any questions about this, send me a message and we can talk numbers. And if this inspires you to GO BUY IMMEDIATELY, then I am clearly an incredible salesperson and we can work together. There you go, it’s your first NEW YORK VALUE!!! I’ll see you back here next week with another little essay about how awesome NY is and how we are not all giant assholes; we just walk quickly and don’t like things in our way.